Fund-raising efforts by the Asbestos Diseases Society of Australia (ADSA) yielded more than $100,000 for Australian researchers in 2012. These donations were generated by the Society's inaugural Charity Walk for Wittenoom Children in May1 and a golfing competition in October.2 This year the ADSA community aims to raise even more research dollars for projects targeting deadly asbestos diseases such as malignant pleural and peritoneal mesothelioma. Next week, the Society will embark on its 2nd annual walk for research and awareness. All of us know that in English-speaking countries certain words have different connotations. This is certainly the case when we use the word walk to refer to the activity the ADSA is planning. In the UK, we take a walk in the park or a stroll by the seaside, both of which involve minimal exertion over short spans of time. What the Society means by walk is best understood within the framework of last year's 600+ km trek from the gold mining town of Kalgoorlie to Perth, the capital of Western Australia. This walk, which took place over five days and involved pairs of participants covering 10-20 km/day, raised $75,000. The distance from Dunsborough, on the southwest coast of Western Australia, to Perth is the same as from London to Hull; given the choice, I would prefer to leave my walking shoes in the closet and support this amazing venture by making a donation. I was able to do this in person when I was in Perth last month. Fortunately, through the wonders of modern technology you can do so through an online link on the ADSA website.4 Larry Graham and the ADSA are doing the hard work, the least we can do is make a few clicks and support them. 1 Kazan-Allen. 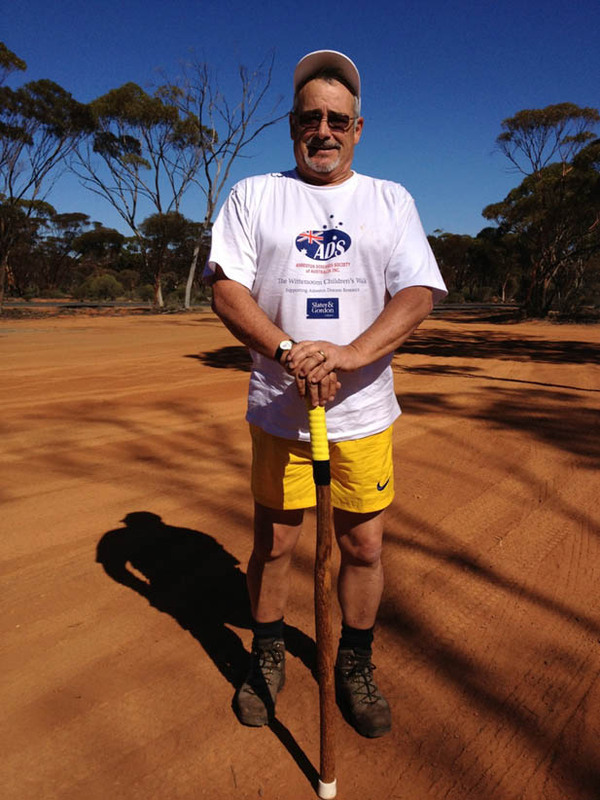 Walk for Wittenoom Children. May, 2012. 2 Kazan-Allen. Fund-raising on the Golf Course. October 16, 2012.